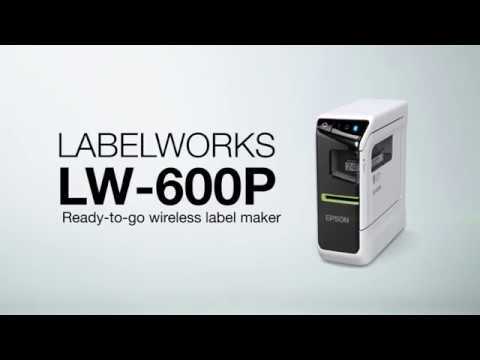 The Epson LabelWorks LW-600P Desktop Label Printer is a compact and portable label maker that features a front-facing control panel to make operating the LW-600P so easy. Three operating buttons light up to tell you when it is switched on, if the battery level is low and whether or not your Bluetooth connection is active. And the Epson iLabel app is intuitive, so it's easy to create professional labels. With its flexible connectivity options, you can either print from your computer, or download the free Epson iLabel app to create and print labels directly from your iOS or Android device. Thanks to its Bluetooth connectivity, you can connect remotely anywhere without the need for a network and share the label maker with multiple users. Featuring 180dpi print quality, labels are crisp and clear. The LW-600P also offers print speeds of up to 15mm/sec. To get you started, the LW-600P comes with one nine-metre tape for black text on a white background. The large variety of tapes available (including Epson's new glow-in-the-dark, reflective and iron on tapes) mean you can always find the ideal tape for the job. The LW-600P prints on a range of widths up to 24mm. LW-600P portable label printer. Print labels from your smartphone, tablet, PC or Mac. Print date labels for food items, QR code labels, or labels to organize cables. Create ribbons for gifts, or even labels with symbols or hand-written messages. Preview labels before printing. Or, use smartphones with voice recognition to create labels fast. Download the Epson iLabel app for iOS or Android devices or choose from other compatible apps available. With multiple tapes to choose from (up to one-inch wide) and an automatic cutter, you’ve got all you need for customized labels on the go.